Omiya Ardija might be one of the smaller and less fashionable clubs in the J League, and they are certainly one of the least successful! But that does not stop them from having an internet presence in both Japanese and English. The leader in the English language stakes is the brilliant Go! Go! 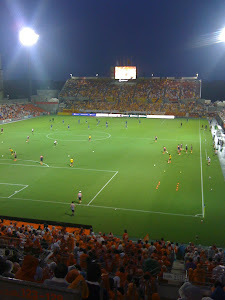 Omiya Ardija. Now I don't know too many details about who is behind this website, but if you have any interest in Omiya Ardija and it's place in Japanese football, then I urge you to read it. The writing is humourous and irreverent, and is definitely one of it's strong points. You can't be a Squirrels fan without a sense of humour. The writers (there seems to be more than one but not sure quite how many - a post at the top of the site mysteriously hints at a legion of dedicated members of the Squirrel Nation.) have a detailed knowledge of the goings on at Nack 5, at least to do with the team and squad. I'm sure they also know a lot more about behind the scenes at Ardija than the average fan too. If the sheer joy of watching Ardija's first team games is not enough for them, they also go and watch the practice games. More evidence of the dedicated members of the Squirrel Nation at work. I'm not sure how long it has been going, but I could find posts going back to 2008 available on there site if you are looking for a bit of recent Ardija history. As a fan of Omiya Ardija, it is a site that I love to check regularly and get a all sorts of useful information and much more besides. Why not check it out? I certainly hope the members of the Squirrel nation keep on producing fine work on the site, which, you never know, might even inspire the lads to do the business on the pitch.